YACHT INSURANCE, OFF SHORE COMPANY INCL. SEASON 2009 75% BOOKED ALREADY! BEST FOR A COUPLE AFTER MID THIRTIES........................................................... ... a dream come true. 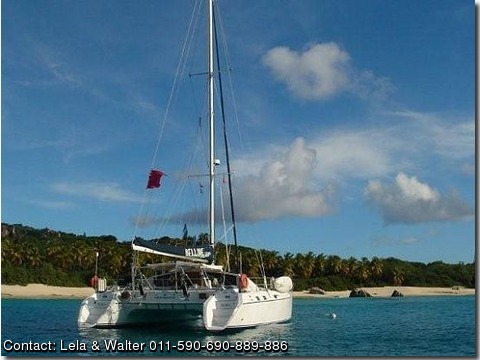 Sailing on Catamaran Belline II is a wonderful experience for everybody , because of her stability , speed and space ! We offer our guests the opportunity to leave stress and concrete civilization behind to enjoy the vacation of a lifetime on the beautifully decorated and fully equipped BELLINE II She is outfitted for luxury and welcomes you with all the comforts of home in fast and stable cruising style. You are invited to enjoy a fascinating sailing experience to the most romantic beaches of the Caribbean. We place high priority on our friendly "feel at home" atmosphere and encourage guests to discover the islands and to personally meet their inhabitants. Belline's enormous deck space is about 1070 square feet which means tremendous space for sun bating and other activities. The two transoms have comfortable stairs down to the swim platform a freshwater shower and the ladder which makes it easy to get in and out the water, hammocks, six large fabric covered sun mattresses and the two forward trampolines (each 65 square feet) to relax. For more shade we can pull up two large sun sail. Four luxurious cabins offer our guests private and comfortable accommodation. Each cabin has a queen-size bed, complete inventory of towels, bookshelves and fans, and ample storage space. Private en suite head and shower with hot and cold water, hair dryers and soaps are provided to your convenience. All cabins are beautifully decorated with cherry wood, ultra suede and finest vinyl. Each one in an different beautiful light colour. Each cabin is equipped with a 15.1" flat screen with built-in speakers and a DVD/CD/CD-RW/MP3 player. A crew cabin is located in the middle section of the catamaran and has a private bathroom as well. The main salon has a foldable teak table and two comfortable ultra suede sofas where you can read a book or listen to music. Belline II offers you music speakers inside, in the cockpit area and on the front deck. The cockpit seating area is a fantastic outside terrace with a teak table and deck chairs where you can enjoy sunrise at breakfast, cocktails at sunset and the stars at dinners. It is fully covered with a bimini and side wing awning for sun shading and two large sun beds are provided on both side of the cockpit where guests may enjoy a night under the sparkling stars. SPORT EQUIPMENT: 14 ft Dinghy with Yamaha 60 Hp 4stroke out board Water Ski, Wakeboard,Fun Tube,Dive Glider etc.